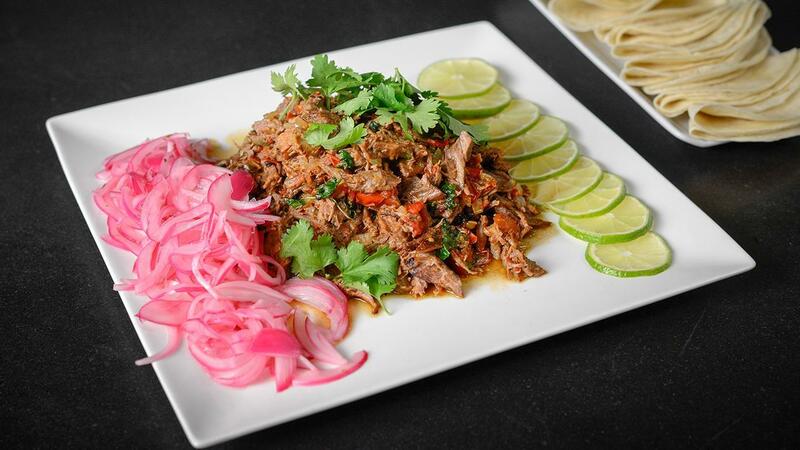 Slow cooked and pulled lamb seared on the plancha with tomatoes, onion and cilantro. Season the lamb with cumin and 15 grams of the Stafford® BLUE LABEL Chicken Broth Base. Sear the lamb in a roasting pan until brown. Mix the water and the remaining Stafford® BLUE LABEL Chicken Broth Base. Deglaze the roasting pan withthe Stafford® BLUE LABEL Chicken Broth Basemixture and place the lamb into the oven. Braise the lamb for 2 ½ hours at 175 C.
Remove lamb and let cool and then shred, reserving cooking liquids. On a plancha or griddle, pour on 125 ml of water and sauté the onion. Stir in tomatoes and serrano peppers and cook until softened. Pour over a 60 ml of reserved liquids. Add in cilantro and sauté until wilted and lamb is warmed through. Serve on a platter with sliced limes. If needed, drizzle additional reserved cooking liquids to cover the lamb mixture. Note: Serve with rice, beans and tortillas.